It is imperative that every college bound student fill out the Free Application for Federal Student Aid (FAFSA). The majority of scholarship funds students receive are awarded from the college in which the student will attend. Many scholarship funds are awarded based on information provided on the FAFSA. 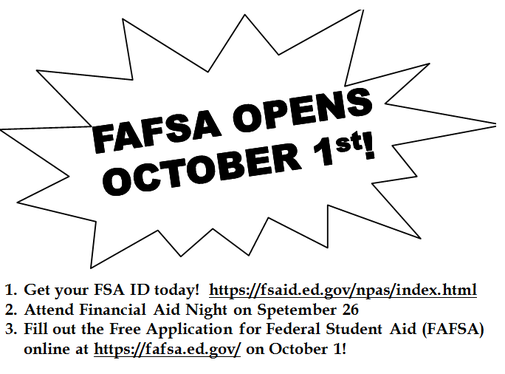 FAFSA opens October 1st of the student's senior year and uses prior-prior year tax information. For example, 2019 graduates will use tax information from 2017 to fill out their FAFSA on October 1, 2018. The FAFSA4caster will help you understand your options for paying for college. You provide basic information and it will estimate your eligibility for federal student aid. FAFSA4caster can be done at anytime during your child’s K-12 career. Get started early! FAFSA on the Web Worksheet allows you to fill out and preview questions that will be asked on the FAFSA. You may fill this out before going online to submit! Students, parents, and borrowers are required to use an FSA ID, made up of a username and password, to access certain U.S. Department of Education websites. Your FSA ID is used to confirm your identity when accessing your financial aid information and electronically signing your FAFSA documents. Scholarships are listed by due date. This is NOT an exhaustive list of scholarships. To review last years scholarship list click here. American Foresters. Due April 1.
three $1,000 scholarships are being offered to qualified senior girls from St. Helens, Scappoose, or Rainier high school. The monies awarded will be deposited directly into the college or university account for the student. Application is due to the counseling office by April 2.
scholarships in an amount to be determined by the board. Applicants must be a member in good standing at Wauna. 2 letters of reference, and a quiz. Due April 15.
of recommendation, letter of acceptance to college, senior color photo (ONLY for American Legion Post), and copy of DD-214 or other evidence of service in the Armed Service from a parent, grandparent, or great grandparent is due by April 20.
by 5 PM on April 30. WEST OREGON ELECTRIC COOPERATIVE- West Oregon Electric awards one $3,000 scholarship lives in West VOLTA SCHOLARSHIP (L): Oregon Electric service area and has an interest in a career in the utility field as an Outside Lineworker. Application is due by 5 PM on April 30. MICHAEL CURRY DESIGN, INC. Michael Curry Design, Inc. is sponsoring a $10,000 grant in honor KIM MCMULLEN MEMORIAL GRANT (SHS): of Kim McMullen, Michael Curry’s executive assistant. Kim believed in taking hold of life, and inspired those around her to do the same. With this grant, Michael Curry Design, Inc. hopes to help a female candidate achieve her goals of school, travel, or independent study. Answer the following question in 500 words or less: How are you working to shape your life? In what ways are you taking action towards your own personal goals, and how would this grant help you achieve those goals? Application is due to the counseling office by May 1. County senior in memory of Don Coin Walrod. Students must be interested in pursuing a career in agriculture, education, forestry, or animal science. Application and essay are due May 1.
solely for vocational training completed within two-year period. the counseling office on May 1. HIGHWAY 30 CRUISERS (L): Highway 30 Cruisers will be awarded a $500 scholarship to a senior student(s) in Columbia County that are enrolled and participating in an automotive or technical related class. Students must have a 2.5-4.0 GPA. Applications must be received no later than May 1.
to a SHS senior planning on attending a trade school or college. letters of recommendation to the counseling office. The deadline is May 3.
evaluated on academics, character, activities, and their essay. is due by May 3. ​ postmarked no later than May 5. MANAGEMENT ASSOCIATION SCHOLARSHIP (L): to a graduating high school student residing in Clatsop, Columbia, Tillamook or Pacific (WA) Counties who attend will be attending college in the Fall of 2019. The student should be planning to pursue a career in business, especially those interested in the Human Resource industry. Application can be found on SHS’s counseling website and is due May 12.
record, essay, and need. The application is dedicated to the memory of deceased Scappoose Kiwanians. The application is due to the counseling office by 4 PM on May 15. 481, St. Helens, OR 97051.
community college. Deadline is June 1.
priority deadline is June 15.